On December 23, 1843, Zuber patented a printing technique called “Tire Ligne”. 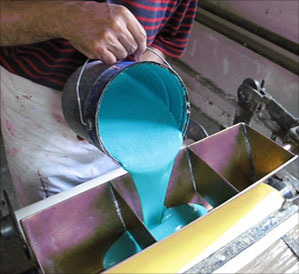 Under a brass tray pierced with regularly distributed slits to let the paint flow, the printer unrolls the already hand-brushed paper. This tray can be divided in as many chambers as necessary to print several colours simultaneously. It is located at the end of a 10m table. There is a pulley mechanism to unroll the paper at a steady pace. 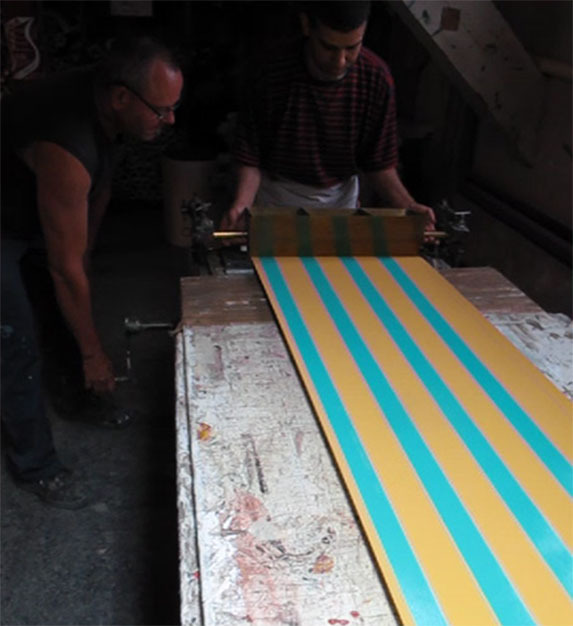 The factory still uses this technique and original tooling to print striped wallpaper. The Zuber factory has a hundred of these troughs, to make as many different stripes.